Enivronmental organisation Greenpeace has a taken a shot at Nestlé for its plastic pollution through a campaign called “Plastic Monster”. Calling out corporations such as Nestlé to stop polluting the planet with single-use plastic, the organisation depicts the consequences of plastics flushed into the ocean. 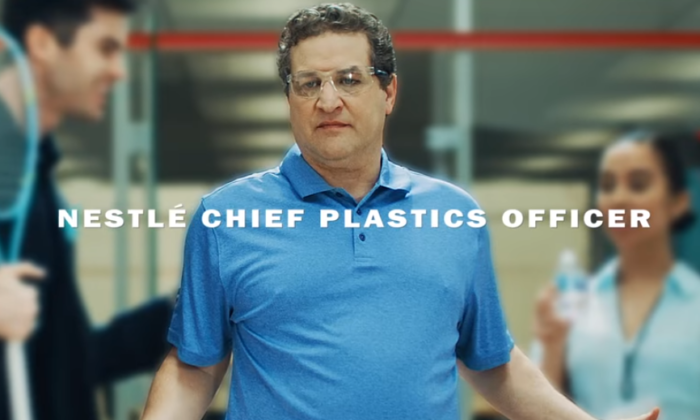 Sparing no censorship on the brand it is targeting, Greenpeace’s ad spot features Nestlé’s “chief plastic officer” heading to a vending machine to purchase more bottled water. When he reaches out to grab the bottle, his hands are covered with algae and a dead fish dropped out as well. The scene looks to replicate the negative effects of plastic pollution to the ocean-beings. On the Greenpeace blog, the organisation quoted the study “Global Alliance for Incinerator Alternatives” and said that Nestlé is apparently the “top source” of branded plastic pollution in waste audits done in the Philippines, where communities have become dumping grounds via the global waste trade. According to the same blogspost, Nestlé produced 1.7 million tonnes of plastic last year, a 13% increase from the year before. Greenpeace International executive director, Jennifer Morgan said while Nestlé claims to be serious about the plastic pollution, the global company has to “take some responsibility for the magnitude of its contribution to the problem”. She added that Nestlé and other companies causing pollution “must be transparent and put forward a concrete action plan, with ambitious timelines, on how to reduce the production of throwaway packaging and invest in truly sustainable refill and reuse delivery systems”. This comes despite Nestlé’s recent strategy in eliminating all plastic straws from its products starting February 2019, using alternative materials such as paper as well as “innovative” designs to reduce littering. Between 2020 and 2025, Nestlé also said it will phase out all plastics that are not recyclable or are hard to recycle for all its products. As such, Nestlé will be rolling out alternative packaging materials across its global product portfolio and establishing partnerships with packaging specialists. Mobile marketing solution partner Art of Click has received more than half a million dollars of seed capital funding and it is exp..